Start with a cage containing five monkeys. Now get a banana and place on top of a ladder. Before long, a monkey will go to the ladder and start to climb towards the banana. As soon as he touches the ladder spray all of the other monkeys will cold water. After a while, another monkey makes the attempt with the same result. All the other monkeys are sprayed with the cold water. 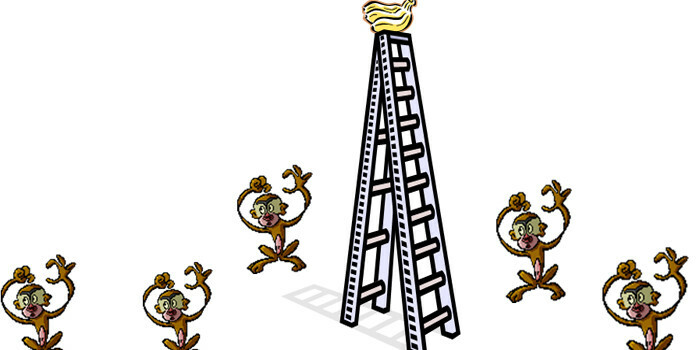 After a while, when another monkey tries to climb the ladder the other monkeys will prevent it. Now, put away the cold water. Remove one monkey from the cage and replace it with a new one. The new monkey sees the banana and wants to climb the ladder. To his surprise and horror, all of the other monkeys attack him. After another attempt and attack, he knows that if he tries to climb the ladder, he will be assaulted. Now remove another of the original five monkeys and replace it with a new one. The newcomer goes to the ladder and is attacked. The previous newcomer takes part in the punishment with enthusiasm. Likewise, replace a third original monkey with a new one, then the fourth, then the fifth. Every time the newest monkey goes to the ladder, he is attacked. Most of the monkeys that are beating him have no idea why they were not permitted to climb the ladder, nor why they are participating in the beating of the newest monkey. After replacing all of the original monkeys, none of the remaining monkeys were sprayed with cold water. Nevertheless, no monkey ever again approaches the ladder to try for the banana. Why not? As far as they know, that has been the way it has always been done around here. That, my friends, is how a rut begins. Be on the lookout for these types of ruts. Take a look at your policies and methodologies and examine their relevance in today’s world. There may be things you doing because that is the way you were taught. But they could be outdated. Sooner or later, you and your company become outdated. Don’t believe me? Just ask Polaroid.